My apologies for being late with this week's post. I had a computer hardware disaster yesterday that saw me lose most of my data, and I spent most of yesterday trying to recover it, without any success I might add. So, I did not get a change to write this week's post until today. 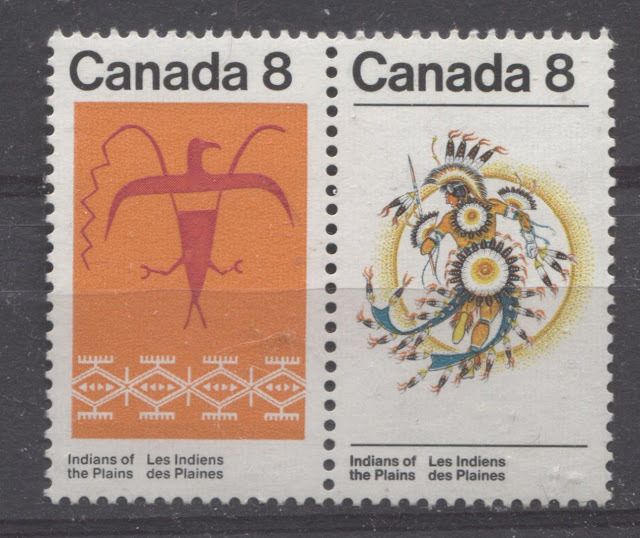 Today, I began my examination of the stamps of the 1970's with the first 10 stamps of 1970. 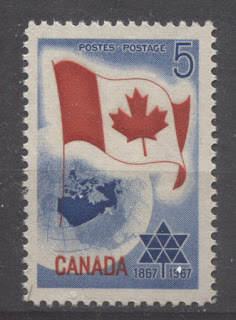 This is one of the supposedly simpler periods according to Unitrade, with no varieties other than the basic Winnipeg tagged versions of the commemoratives being listed. 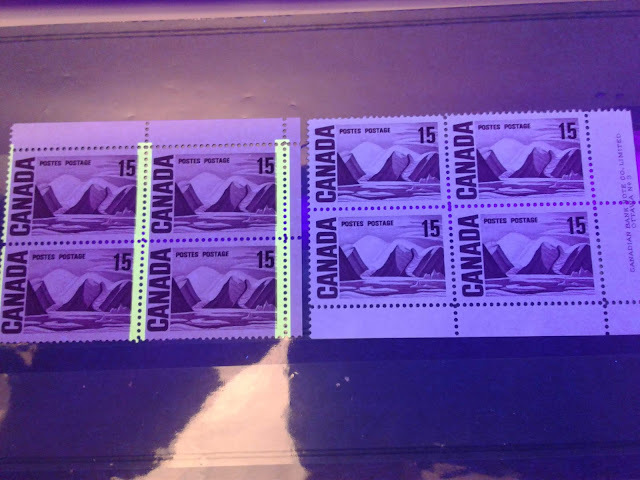 In contrast to the previous two years, in which most of the stamps are printed on fluorescent papers, this is the first time in two years that the vast majority of the 10 stamps are printed on dull fluorescent papers, with only one issue being issued on high fluorescent paper. 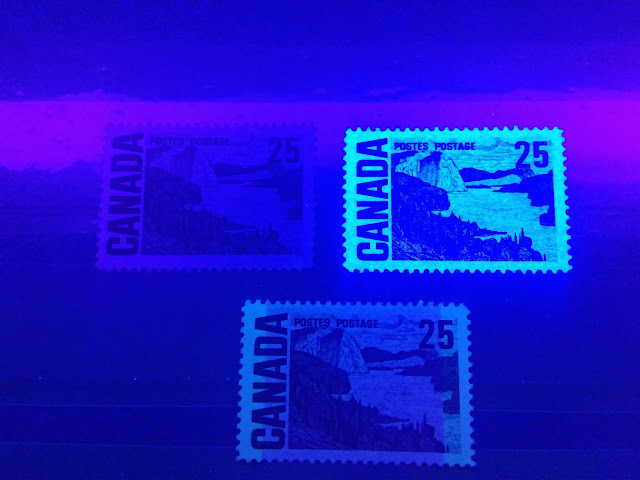 Despite the relatively simple appearance, it turns out that most of the issues have upwards of 6 different varieties of dull fluorescent paper. 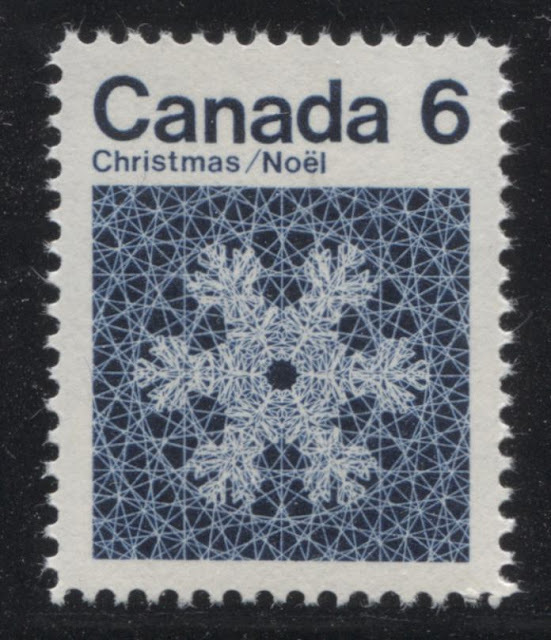 There are also the usual variations in perforation on the CBN printed stamps. When these two factors are combined, there is quite a bit more collecting scope than one would expect at first glance. 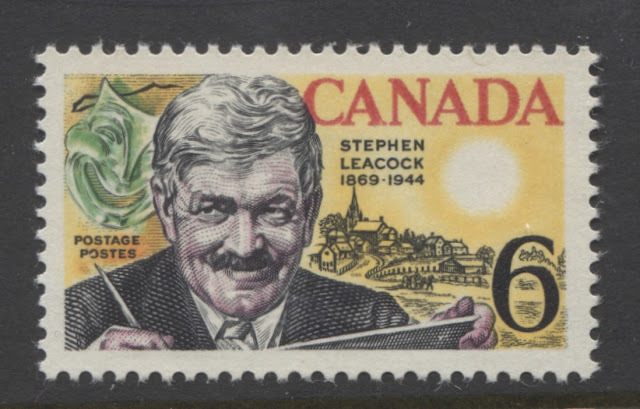 This week is the first of my shorter posts, which will explore the first half of the commemorative issues that were released by the Canadian post office in 1969. 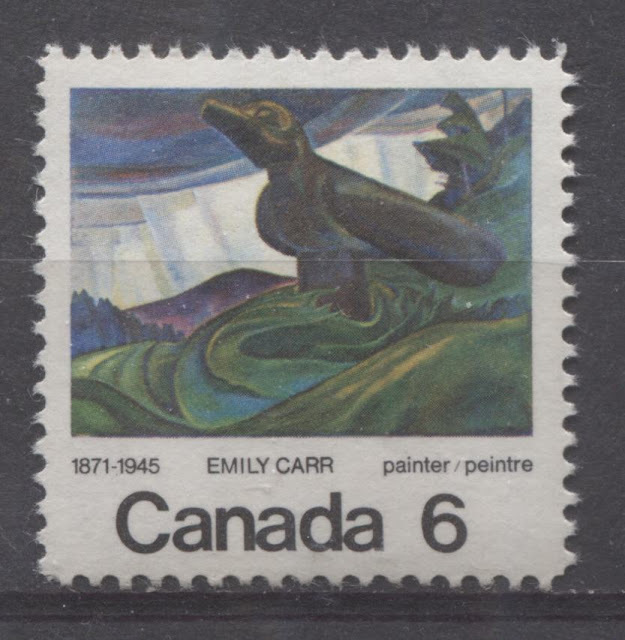 1969 continues the innovation that was begun in 1968, with hibrite papers firmly taking hold as the standard paper used for stamp printing, and the prevalence of dull paper beginning to drop off. The 10 comb perforation that the BABN had introduced in 1968 is abandoned by them and replaced with a much finer 12.5 x 12 comb perforation. In terms of printing techniques, photogravure and engraving and lithography and engraving are the most common, but pure photogravure and pure lithography are used also. It has become apparent lately that I simply do not have enough time to write my detailed blog posts, while tending to the other aspects of my business and personal life that need attention. 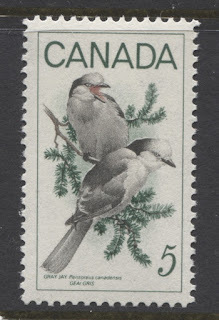 I am finding that to complete these posts to the standard that I believe is important is taking me between 8-10 hours, which is essentially an entire day for the Canadian post and about half a day for the Nigeria post. I can only really devote a day to blogging in a week. So, my choices are basically to either change my posting schedule to once per week, or shorten the length of my posts, so that I can still deliver some content each and every week. After careful consideration, I have decided to opt for the shorter posts. I have done some research on reader engagement, and there is quite a lot of evidence to support the notion that readers will engage better with shorter posts anyways. Today's post took longer than expected because I took a different approach this time. Rather than detail the paper varieties, shades and paper varieties separately, I identified the shade varieties first and then for each identified variety of shade, I detailed the paper and gum varieties. This makes for a more precise determination of the maximum number of varieties that may be found. I must apologize again to my readers for another break in the continuity of my posts. I had resumed posting last week and had hoped to complete this week's post today before I go on vacation tomorrow for two weeks. However, the final content edits that I had to make to the my new website took more time than I expected, so unfortunately I did not get a chance to prepare this week's post. However, the website is now completely functional. The only thing I have left to do is migrate these blogs to it, install the language translation app and connect all the social media sales channels. I will deal with all that when I return, as well as resuming my regular posting schedule. I do apologize for all the interruptions, but I can promise you all that I don't have any other plans, except possibly to take a week in January next year. So, you can look forward to at least 2 or three uninterrupted months of postings. I will do this for the next several weeks to give all my readers a chance to get used to reading the new blog on my website, and then eventually, I will move the content from this blog to my website and will shut this blog down. One More Week Until Posts Resume - Almost There! I wanted to let my readers know that I am almost finished my new website, and need another week to complete the finishing touches. So, I will not be posting this week either. 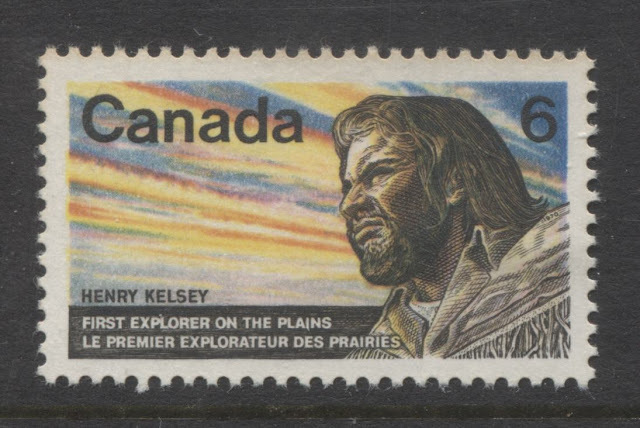 However, I will pick up where I left off next Tuesday, with the 25c Solemn Land stamp from the 1967-73 Centennial Issue. Thanks very much for your patience. I have added a lot of information resource pages aimed at collectors of all levels of experience. The "Getting Started With Stamps" section covers a lot of topics for beginners, and "Stamp School" covers a range of topics for the intermediate to advanced collector. I would love to have comments about any topics that you think should be covered that are not, as I would like to include as many as I can ultimately. I wanted to apologize for the fact that I will be unable to write any new posts for the next 2-3 weeks. I feel that I owe all my regular and loyal readers an explanation for why I am having to delay my posts, so here goes. 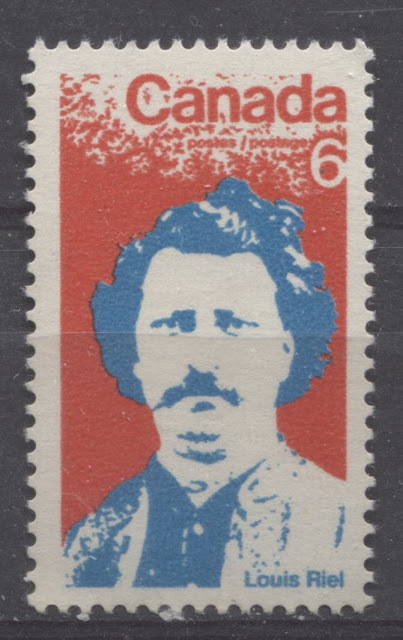 When I started out as a stamp dealer and blogger, my intention was to focus all my attention and energy on building the best stamp stock that I could, writing top quality content and getting into a position to be able to service collectors from all over the world. This is no easy task, as I have written about many times in the past. So, when it came to deciding how I wanted to build a business online, I thought that paying a company like e-bay to take care of all the information technology, transaction processing, marketing etc. would make sense. I really thought that e-bay would act like a business partner and help my business grow, in exchange for the $500-$700 I was paying them every month. I was wrong. Dead wrong. With over a year in the making, this series of posts is finally entering the home stretch, with the last four values of the set: the 20c, 25c, 50c and $1. 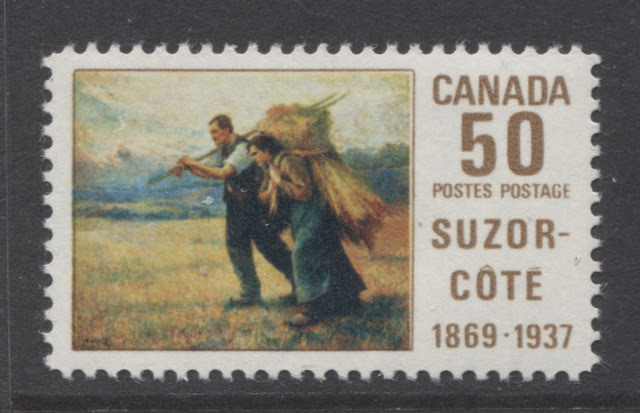 This week I will deal with all the printings of the 20c value, which depicts "The Ferry Quebec" by J.W. Morrice. It is one of the less complicated values in the set, at least according to Unitrade. However, as we shall see, there is still plenty of scope to interest the specialist. Interestingly, none of the high values from this point forward exist with general Ottawa tagging. This value exists only Winnipeg tagged.